Participants of the training program on ‘Development of agribusiness and food processing business incubation centres’ with the ICRISAT team. 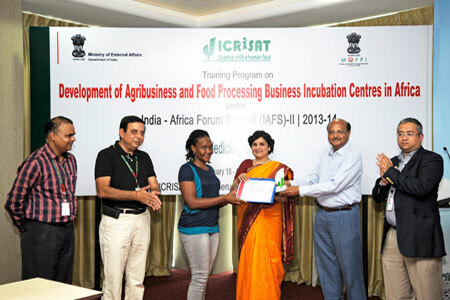 “We are committed to work closely with our partners in Africa to boost the agri- and food-processing sectors across the continent through strategic interventions that strengthen value chains, promote food safety, develop innovative products and technologies, facilitate entrepreneurship, and ultimately help the smallholder farmers,” said ICRISAT Director General, Dr William Dar. “Our mission is to make smallholder farmers in the drylands prosperous, not just self-sufficient. And that is why we are engaged in promoting an inclusive and technology-based entrepreneurship and agribusiness program,” Dr Dar added. 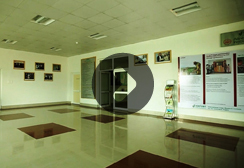 The Director General was speaking at the inaugural session of the ‘Development of agribusiness and food processing business incubation centres’ held from 18 February to 1 March at the ICRISAT headquarters. Twenty-four food processing and agribusiness professionals from Africa from Uganda, Kenya, Zambia, Mozambique, Angola, Cameroon, Ghana and Mali attended the training program organized by ICRISAT through its Agri-Business Incubation (ABI) Program under the Agribusiness and Innovation Platform (AIP). The activity was part of ABI’s ongoing Food Processing Business Incubation Centre (FPBIC) Project supported by the Ministry of External Affairs and the Ministry of Food Processing Industries, Government of India (MoFPI, GoI) under the India-Africa Forum Summit-II. 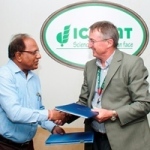 The activity was in line with ICRISAT’s South-South Initiative which aims to capitalize on the already established strong and successful India-Africa partnership, to strengthen the institute’s role as driver of prosperity and economic opportunities in the dryland tropics. The Initiative provides a platform for focused and systematic international relationships critical for a more effective and inclusive development cooperation between India and Africa. Mrs Kiran Puri, Joint Secretary (Finance), MoFPI, GoI, attended the training’s valedictory program on 28 February as Chief Guest and spoke on the importance of the activity in setting standards in food manufacturing and in enhancing the food processing business incubation initiatives in Africa. The two week program was designed taking into account the existing ground realities and gaps prevailing in the participating African countries with respect to setting up of food processing business incubators. Participants were involved in dedicated sessions on food biotechnology and nutraceuticals, health and nutrition though modern biotechnology, probiotics and bioactive foods, nutrition research, challenges in development and commercialization of functional foods, combating health and nutrition challenges through a partnership approach, incubator planning, operations management, leadership, governance, financial, investments, and client scouting and engagement. Field visits were also organized to some of the agribusiness incubators under the Network of Indian Agri Business Incubators (NIABI). Participants were also provided with hands on training on management practices for efficiently and profitably managing food business incubators. 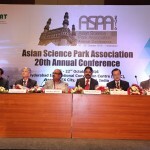 Dr Kiran Sharma, Chief Executive Officer of the AIP stated that the training activity was in accord with ICRISAT’s vision of a prosperous, food secure and resilient dryland tropics. Mr SM Karuppanchetty, Chief Operating Officer of ABI Program stressed that the main focus of the bilateral project is the establishment of state of-the-art FIBCs wherein ICRISAT shall provide in-house training, hand-holding, mentoring and technical support to the staff deployed. Mr Aravazhi Selvaraj, Manager, ABI Program gave a detailed overview of the training program to the participants.